A few weeks ago I saw a Mexican Whip-poor-will in Arizona and reported it as my 720th North American Life Bird. Later, I found out that late in 2013 there was a split of one of my prior sightings, Sage Sparrows, into two species, Bell’s Sparrow and Sagebrush Sparrow. I checked my records and found out that I had seen both of them, Bell’s near Hollister, California in 2004 and Sagebrush in western Arizona a few years later. Consequently I am assigning number 721 to Sagebrush Sparrow, and thus accounting for the jump from 720 to 722. 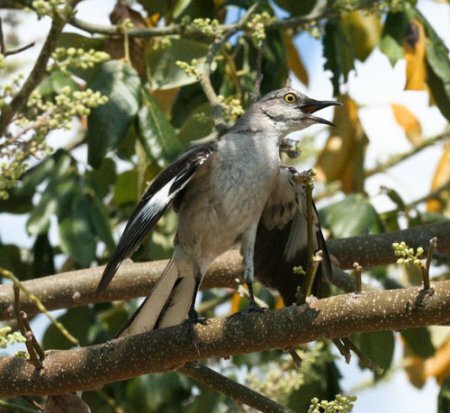 Number 722 was the lone Bahama Mockingbird, (ABA Code 4) which has been seen for a week or two around Fort Zachary Taylor State Park at the south end of Key West, Florida. We spent a very hot afternoon searching for it, following up on all the distracting Northern Mockingbird songs. 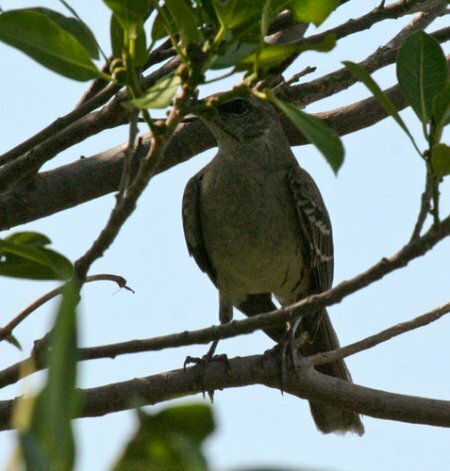 We finally found the Bahama Mockingbird to the northwest of the Fort, feeding from a berry tree that it refused to leave, but in which it was difficult to photograph. He (or she) was very cooperative in every other respect, allowing us to approach very near for as long as we wished. We left immediately to drive north on the Keys to the Marathon Airport, the best spot in Florida, reportedly, to find Antillean Nighthawks (ABA Code 2). We looked at the south end of the airport with no luck. As dusk approached, we drove around to the north side. Antillean Nighthawks were just taking to the air over the airport with their distinctive “pitty-pit-pit-pit” calls. They cavorted aerially within yards of us as we stood in the parking lot at the north end of the airport, near the Air Museum and the helicopter ride concession. One pair showed us their distinctive, elongated white wing-bands as they flew low and directly over us. We couldn’t manage to photograph them because of darkness and their constant and rapid aerial motion. This capped a most successful day as I chalked up Lifer number 723. We stayed overnight at the Marathon Holiday Inn Express, a very pricey lodging, and enjoyed a delicious dinner of Yellowtail and chips and a local beer at the Tarpon Creek Bar and Grill just a few steps from the Motel. The next morning we returned to Key West to catch a plane to Tampa, where I would concentrate on finding Budgerigars (ABA Code 3) and Nanday Parakeets (ABA Code 2). From Tampa, we drove north to the area near Hernando Beach where the quickly disappearing Budgerigars had been reported seen a year or so ago. In spite of our best efforts driving through the neighborhood, we did not locate any of these lovely little exotics. As the day grew short we decided to abandon the effort and drive to Walter Fuller Park in St. Petersburg to try for Nanday Parakeets. The drive was dreadful; traffic was heavy, and red-lit traffic lights refused to turn green. We finally arrived at Fuller Park and walked all the way around and through the park, which is very nice, with no luck. We decided this was not our day, so we would find a room and a restaurant in preparation for our long drive the next day to try to find our fifth target bird, the recently added ABA bird, the introduced Purple Swamphen (ABA Code 2). As we left the Park, we made a wrong turn and when we discovered we were going the wrong way, I pulled into a little driveway to turn around. 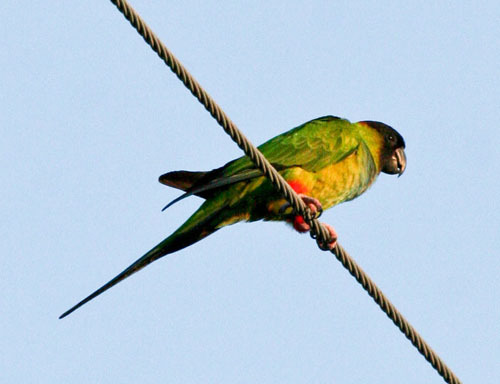 Directly above the car perched on a wire was a Nanday Parakeet in full view, displaying its beautiful green, blue, red and black colors from all angles as it turned around and around. The day was not lost, as the Nanday Parakeet became my 724th Lifer. I do not expect to have the pleasure of making many more 3-lifer trips. Elated I was. We decided to get a head start on our three hour drive to a wetland area near Clewiston, Florida, where Purple Swamphens had been seen. An hour or so later we stopped at a motel and were told that they were full, and we better go back to Tampa if we expected to find any vacancies that night. It seems that the Indian Bollywood awards were a great attraction in south and central Florida, and all the motel rooms in the area had been taken up for that event. Tired and frustrated, we turned around and went back to Tampa, where the clerk at the local Hampton Inn had kindly called ahead and made reservations for us. We arrived, of course, late and hungry. A dinner at Red Lobster restored our spirits. and nearly motionless little Swamp Rabbit. We struck out on the Purple Swamphen, however, and returned to our car several hours later, thirsty and exhausted, and made the long trip back to Tampa to catch a plane for home the next morning. The driver at the motel near the airport in Tampa suggested that the Cheesecake Factory would be open late on Sunday night and that it was very close by. We went there, sat outside on a beautiful Florida spring night, and watched the interesting people arriving and departing from the nightspot next door. Our server, Patrick, did a great job and the food was outstanding, so we lingered until midnight, knowing that we did not need to have an early start on the morrow because all the early Delta flights were overbooked. After a long and stressful day at the airport we felt lucky to finally find a flight on Southwest, directly from Tampa to Chicago and Des Moines, where we arrived at nearly the same time as if our original plan to return by Delta through Atlanta had materialized. The American Birding Association has created 5 Codes (6, if you include extinct birds) to classify the difficulty of finding each species of bird ever found in North America. Code 1 is the easiest and contains the most birds (approximately 500). A few years ago I thought I had seen all of the Code 1 birds except the Purple Sandpiper. A trip to Maine in winter a couple of years ago produced good results, and I was able to check off the Purple Sandpiper. Refer to my Purple Sandpiper blog entry. But in the meantime, the ABA split the Whip-poor-will into two separate species: the Eastern Whip-poor-will and the Mexican Whip-poor-will. The two are nearly indistinguishable except that they have distinctive calls and they are located in sharply different areas of the country. I had long ago and on many occasions seen and heard Whip-poor-wills, but they were all of the Eastern variety. I communicated with a retired bird guide in Arizona with whom I had birded on one of my first birding trips, in about 2000. He gave me some suggestions as to when and where Mexican Whip-poor-wills might be seen in Arizona. He said that late April and the first three weeks of May would probably be best because the birds are calling more frequently at that time. He also suggested that full moon could be helpful because they tend to vocalize more on bright nights. Unwilling to wait for the May full moon, Barbara and I took off, flying standby, to Arizona on April 15th, to arrive the day of the April full moon, coincidentally also the night of the eclipse producing the “Blood Moon”. We drove first to Patagonia and from there to Pinery Canyon in the Chiricaua Mountains in far southeast Arizona, arriving at the east entrance through the village of Paradise. The gravel road leading to Paradise from Highway 10 goes through a flat agricultural irrigated area. We started down that road about 6:30 p.m. and saw not a single vehicle or human being for the next 45 minutes, when we arrived at Paradise. The road became increasingly narrow, steep and rough as we neared and passed through Paradise. At about 7:30 p.m. we were elated when a Whip-poor-will fluttered up from the edge of the track and flew about in our headlights for a few seconds before disappearing into the trees. Success!!! How could it be so easy? To top it off, within a few minutes we heard the call of the Mexican Whip-poor-will close by the road, as we crept along at about 5 miles per hour with our windows open. The elusive Mexican Whip-poor-will became number 720 on my North American Life list. Now I await further splits of species by the Ornithologists to create a new Code 1 bird that will force my hand once again. Before we started up this mountain canyon we took note of the sign warning that drug dealing and smuggling activities occurred within the Canyon and that caution was advised. We were slightly nervous about this, and became more so as the night wore on and we drove through even rougher and narrower tracks, still with no sign of human life. 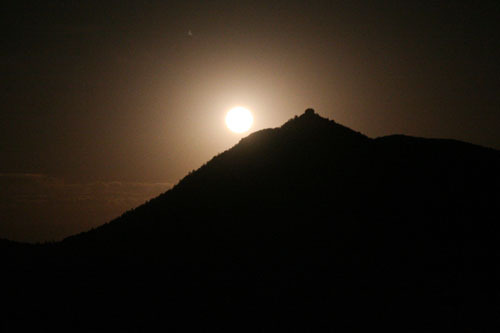 Near the top of the canyon we saw the glow of the full moon behind a mountain peak and arranged to stop to take a picture as it emerged over the peak. Orion, the Dog Stars, Ursa Major, Ursa Minor and many other constellations were by now prominent in the night sky. 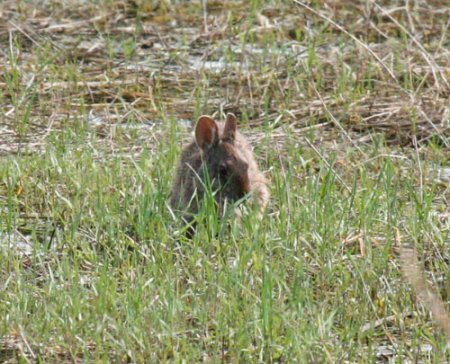 At about 9:00 p.m. we emerged from the canyon on the west side of the Chiricauas, and saw our first mammalian life, a big Jack Rabbit, running across the road and a Cottontail soon thereafter. We were nearly back to Willcox and our motel before we saw our first motor vehicle since leaving Highway 10 at 6:30. There still are some remote parts of this country. Before we drove to the Chiricauas, we detoured to Patagonia to see the hummingbirds and other species at the Paton’s place. 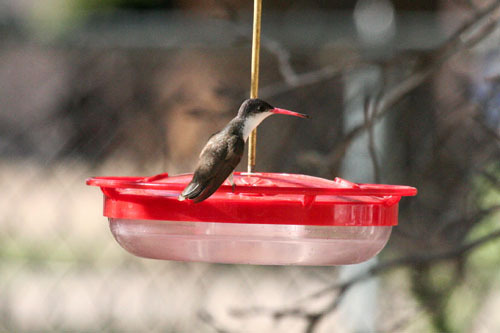 Among the Hummers were Broad-billed, Black-chinned and Violet-crowned Hummingbirds. There were quite a few species other than Hummingbirds on the premises to add to our enjoyment of this byway. On the next day we drove to Tubac, Arizona to try to see the Sinaloa Wren that has been hanging out on the Anza Trail for several weeks. This would be a new life bird for me. 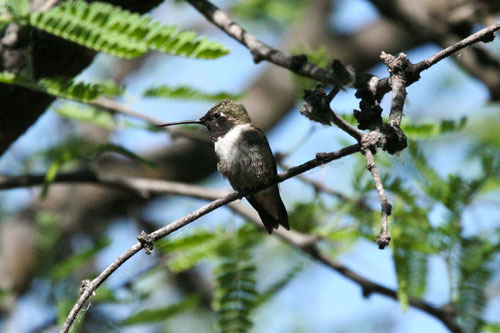 This Mexican bird is being seen more frequently in the U.S. in the last few years as it attempts to extend its range northward. Unfortunately, we along with a dozen or so other hopeful birders were disappointed in not finding it before we had to leave to get back to Tucson for our flight home. As we were returning on the trail, a male Black-chinned Hummingbird attracted our attention as it engaged in its mating ritual just a few feet from the trail. I would describe it as flying back and forth at low altitude in the fashion of a pendulum, buzzing loudly. 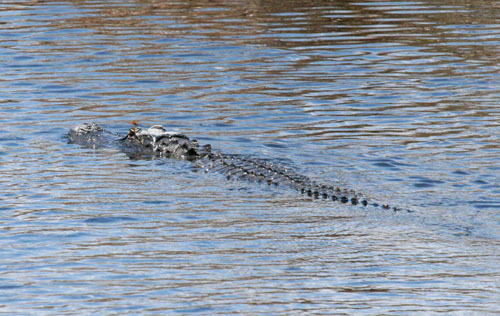 This would go on for 20 or so seconds, and then he would perch motionless on the same low-hanging branch of a mesquite. On April 7, 2014, I left Des Moines about 7:00 a.m. and drove to the Ringgold County Conservation Area to see the Prairie Chicken mating display. I was hoping that this distinctive, and now rare in Iowa, prairie resident would represent number 100 on my 2014 Iowa species list. The Ringgold County population is the only known remaining population of Prairie Chickens in Iowa, and this only because of extensive reintroduction efforts. As I was driving through Kellerton, a Eurasian Collared Dove blatantly displayed itself on the road in front of my car and I could not ignore it, so this introduced species became my 2014 Iowa #100. A few miles later I was the lone observer at the deck looking eastward toward the Prairie Chicken lek. I was not disappointed, for 10, I believe all males, were cavorting about. They made a great display and a good start for my day. I hope this reintroduction effort succeeds in restoring such an iconic prairie bird in Iowa for the delight of generations to follow. I was reminded of my father’s account of his childhood trip by wagon across northwest Iowa to their new farm home in 1884, where the Prairie Chickens flushed from the grasses by the dozens per mile. I was also reminded that he became one of the best shotgun hunters in the area, bringing home Prairie Chickens which were a staple of the dinner table in his farm home. He would have enjoyed watching this now rare display, as he loved, as well as hunted, the birds. The weather was not conducive to birding. High, cold, north winds and intermittent rain squalls prevailed all afternoon. I drove up and down muddy Buffalo Creek Road, using my spotting scope to look south from the protection of my car, as the rain and wind pelted the north side window. Thousands of Sandhill Cranes were crowded into a field of corn stalks, but they stayed quite close to the south border of the field, about a quarter mile from the road and adjacent to I-80. For most of the afternoon I was the lone birder. About 4:00 a woman from Massachusetts arrived and we agreed to split the duties of scoping the flocks of Sandhills and exchanged cell phone numbers so we could communicate with each other if one of us spotted the “Bird”. As the rain became heavier, the cranes spent more time shedding the rain with their necks extended, making it more possible to distinguish the Common Crane, if present, from the Sandhills. She first spotted the Common Crane, then lost it. Knowing it was there, and the general location, I was able to refind it and we both were able to enjoy excellent looks as it moved to the nearer edge of the Sandhill masses. Thus, the Common Crane, a Code 4 ABA bird, became number 719 on my North American Life List. I arrived home about 10:30 p.m., for a satisfactory closing to a very long day on the road.